When the police pull over it usually means you’re in some sort of trouble. But that wasn’t the case for this group of kids in Surrey. Unless getting dunked on is a criminal offence. 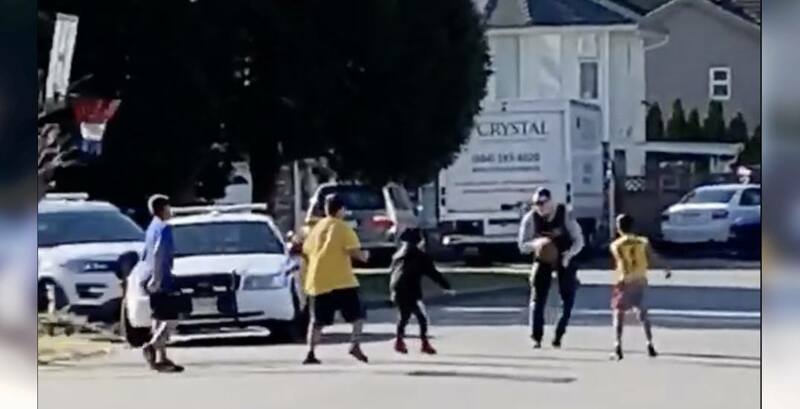 They were kicking off their spring break vacation on Monday by shooting hoops outside when an unknown Surrey RCMP officer stopped beside them to join in on a game of pick-up basketball. The heartwarming moment was caught on video by Ereen Dizon, a dad of one of the boys. “I took the video as it is a rare thing to see and I wanted to share to everyone what the officer did even if it was only for about 10 minutes,” Dizon told Daily Hive. After the game, Dizon asked the kids what they thought about the game. “They said at first they thought they were in trouble up until he asked if he could play,” said Dizon.